My family and I have been fortunate enough to have never experienced a large-scale natural disaster or terrorist attack. I can only imagine what it would be like to have your home, cars and economic stability destroyed from a natural disaster. Consider that tragedies of the devastating forest fire that destroyed the community of Paradise, California a few months ago, or the destruction left behind after one of the hurricanes that have hit along our eastern and southern shores. It’s hard to contemplate the destruction, heart ache and fear that comes from being a victim of the disasters or the pain of having a loved one victimized from a terrorist attack. The Community Emergency Response Team’s program (CERT) is designed to train individuals in how to respond to emergency situations such as floods, earthquakes, wild fires and even terrorist attacks that may occur within their own community. CERT members are the first responders to their family, neighbors and community members until professional personal arrive. 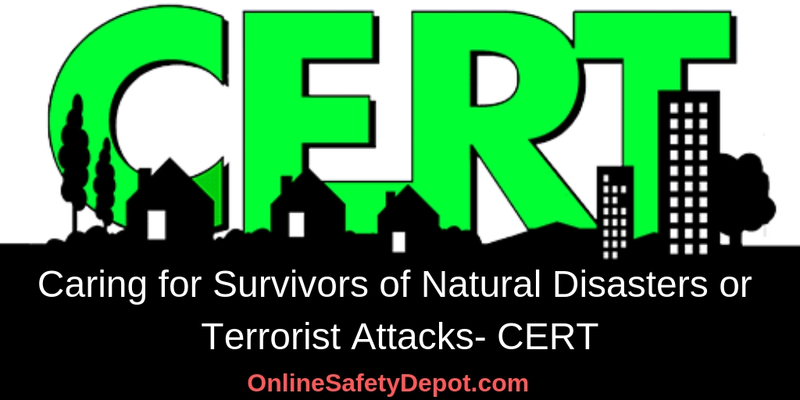 You may also be interested in our other related articles titled, “Overview of the Community Emergency Response Team Program- CERT” or “The Community Emergency Response Teams (CERT)”. In this article we cover the basics to survivor care including intervention for primarily obstructed airway, bleeding, and shock. An obstructed airway is fatal unless the obstruction is removed and air flow to the lungs is restored. One potential cause of an obstructed airway for an unconscious or semiconscious individual that of their own tongue as the relaxed jaw muscles allow the tongue to move posterior, place on the epiglottis, and obstruct airway. There may be other reasons for why their airway is blocked such as blood, mucus/saliva, food, or some other foreign object that has become stuck in their airway. It may be hard to tell if an unconscious survivor has a blocked airway, or if an individual is not breathing, but there are some signs and symptoms that you can look for. 1- Look: Look for the repeated rise and fall of the chest. This movement maybe small and hard to detect, especially in a dark or dust filled room. Another strategy that can be implemented, especially if it is hard to get close to a victim, is to place a mirror next to the victim’s mouth and look for signs of condensation appearing on the glass indicative of moisture from expiration forming on the mirror. 2- Listen: With your ear positioned a few inches from their mouth, carefully listen for the sound of breathing. This too may be hard as the immediate area around you may be filled with sounds such as sirens, commotion, and other typical sounds of being outdoors or in a building. 3- Feel: Depending on the situation, feeling may be the best option. Place your hand gently on the victim’s stomach and feel for any abdominal movement. Place your hand on the person’s forehead to hold it steady. With the other hand, place two fingers under the person’s chin and lift the jaw while gently tilting the head backward. Remember, the person may have other injuries that you are not aware of so controlled deliberate movement is needed. With the head tilted backward, check to see if the airway has been restored and they are breathing again. To do so, place your ear over the person’s mouth and your hand on the person’s stomach and look at the person’s chest. In this tilted position, look for chest rise and fall with respiration. Listen and feel for breathing with your ear next to their mouth and while watching the victim’s chest for movement, as previously indicated. Note: If this doesn’t restore respiration, begin CPR immediately. Bleeding, like an obstructed airway, can be fatal if not properly treated. Uncontrolled bleeding can lead to weakness, shock and eventually death. There are two main types of bleeding, internal and external bleeding. It can be difficult to diagnose someone with internal bleeding unless you are medically trained to do so. External bleeding is easier to assess and treat. Blood is transported throughout the body via the arteries, veins and capillaries. Each of the blood transport tubes manifest differently in how they bleed. Being able to tell which type of bleeding it is will help you determine how serious it is and how to go about treating it. Arterial Bleeds: Cut arteries spurt blood. The blood is pumped from the heart to the rest of the body under good pressure. As a result, an arterial wound bleed will shoot out of the wound with every heartbeat. Arterial bleeds are the most serious as they produce the most rapid blood loss and should be treated immediately. A person with an untreated arterial bleed can die in minutes. Venous Bleeds: Damage to veins produce a constant steady flow of blood. As blood returns to the heart, it does so under low pressure, and mainly produced as the result of blood being forced back toward the heart with muscle skeletal contraction applying a “squeezing” force to the veins. A venous bleed is still dangerous and needs to be treated quickly to prevent too much blood loss. Capillary Bleeds: When capillaries are damaged blood oozes from the wound. Just like venous blood, capillary blood is transferred under low pressure. Capillary bleeds are not critical as arterial or venous bleeds and can easily be addressed by bandaging the wound. To control bleeding, do one or more of the following. 1- Direct Pressure: Apply pressure directly over the wound with a clean dressing. Note: If you wrap the bandage round a limb, be sure to tie it off with a bow and not a knot. This will allow you to easily loosen the bandage if it is too tight as well as allow you to quickly and easily check the bandage. 2- Elevation: Lifting/elevating the wounded body part above the heart level will help slow the bleeding as the force of gravity helps reduce the blood flow to the wound. Elevation should be used in conjunction with direct pressure. 3-Pressure Point: For arterial bleeds, applying pressure to the actual artery, known as a pressure point, is the most effective means to stop bleeding. While arteries are typically located deep as compared to superficial, being able to effectively apply a pressure directly over the artery is very effective in stopping bleeding. Fortunately, there are places in the upper and lower extremities, where an artery crosses over a bone, providing a location that you can apply pressure causing the artery to be compressed against the bone to stop the bleeding. See image for pressure point locations. Shock is a disorder that results from the ineffective circulation of blood. Prolonged shock can lead to death of cells, tissues and even entire organs. Rapid, shallow breathing. This is the body’s attempt to increase the amount of oxygen being breathed in and delivered to the blood. Rapid, weak pulse. When the body is not receiving sufficient blood, the heart will respond by increasing its rate of contraction (pulse rate) in an attempt to deliver more blood. Confusion. A failure to respond to simple commands such as “What’s your name” or “Squeeze my hand”. Pale (white or greyish) color. Oxygenated blood flow is what gives the skin its fleshy or pink color. When blood flow to the skin is inadequate due to a weak or absent blood flow or has been diverted to the organs of the body that need the blood to continue working, the skin turns pale. Prolonged capillary refill. A simple test to check for adequate blood flow to the periphery or skin is to pinch the victim’s fingernail. This will force blood from the area and the skin will become white. If blood flow is normal, the pink color of the nail should return in less than two seconds. If the nail bed stays white/pale, then this is a sign of inadequate blood flow to the area. If the person is having difficulty breathing or is hyperventilating, try to get then to relax and breathe normally. Position the person on their back and elevate their legs about a foot off the ground (if there are no injuries that would be made worse by doing so. If the weather is cool, try to warm them by wrapping them in a blanket. Maintain a conversation with them and try to get them to engage with you and focus on your voice. If the person starts to throw up, turn them on their side to prevent them from chocking or aspirating. Try to remove any expelled material so is does not pose a further risk. If they stop breathing, start CPR right away. Hopefully you are never in a situation that requires you to preform these actions. However, knowing what to do and how-to best help others in their time of need is what the Community Emergency Response Team’s program is designed to teach you and help you feel confident in performing. I highly recommend taking the course and then would encourage your leadership in your community.